Adds new recipes and foods to the game. You may not use the Braised Beef or Mushroom Soup textures included with this mod without permission from darthsloth74. If you would like to use any other part of this mod in your own free project, just give me credit for my work. I would also appreciate a heads up. However you may not include any other part of this mod in your project if it is being sold, for money, on Steam Workshop or other platforms. Please do not re-upload this mod anywhere without my permission. Appropriate items have been added to leveled lists, so you will occasionally find some of them for sale at inns or in loot. Slaughterfish Meat has been added to the Slaughterfish death item list. 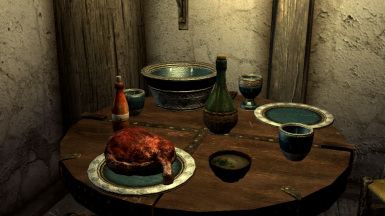 Additional items in the Dragonborn patch: Baked Yam, Yam Soup, Sweet Yam Pie, Boar and Apple Stew, Ash Hopper Stew and Pickled Ash Hopper Leg. 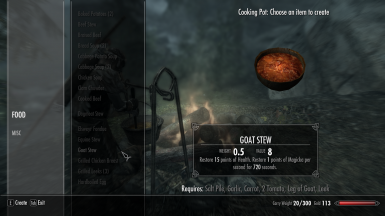 The patch also adds a recipe for Cooked Boar Meat. Manual: extract the contents of the archive to your SkyrimData folder and activate CookingExpanded.esp in the launcher or your mod manager. Manual uninstall: Deactivate CookingExpanded.esp, then remove it along with CookingExpanded.bsa from your Data folder. NMM: should work through the Nexus "Download with Manager" link, let me know if it doesn't. This mod will be recognized by BOSS, I recommend using that to sort your load order. Some leveled lists from Skyrim.esm have been edited. If you use other mods that add to the food lists, you will need to use Wrye Bash to create a bashed patch. I also edited the empty SpitPot containers to give them a 25% chance of having soup or stew inside, this will conflict with other mods that change those. Load whichever mod you want to have priority last. As of version 1.2b, this mod has built-in support for Frostfall 2.0. Patches for Hearthfire, Dragonborn, Imp's More Complex Needs, Phitt's Alchemy and Food Overhaul and YASH are available in the Optional Files section. If you would like to translate this mod into your language and upload it onto the Nexus, feel free to do so, no permission required. If you let me know about it, I will add your translation to this page.